There's a lot to love when it comes to pop groups, but does more members equal bigger fandoms? Or can solo acts still hold their own? We'll find out soon enough, but first, only one group can make their way to the semi-finals. Will K-pop stans force a face-off between BTS A.R.M.Y. and EXO's EXO-L, or can 5 Seconds of Summer's 5SOS Fam edge out the competition? We're putting it to the test. 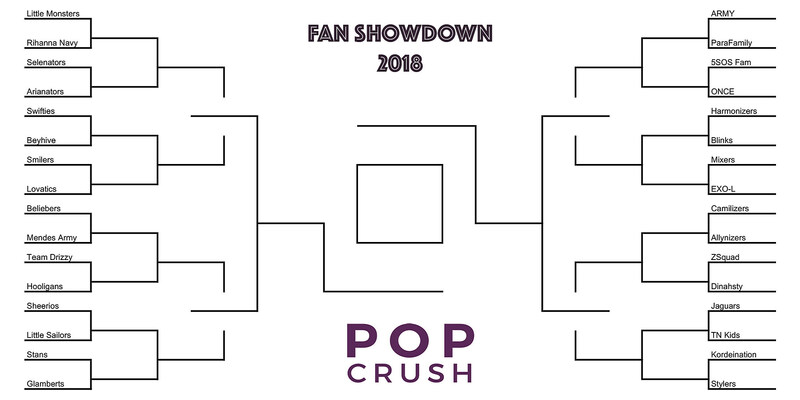 Round 1 of the competition begins today (April 3) and ends on Tuesday, April 10 at noon; Round 2 begins April 11 at noon and ends on April 16 at noon; Round 3 begins April 17 at noon and ends April 22 at noon; the Final Four begins April 23 at noon and ends on April 25 at noon; and the winner of the final showdown will be revealed on May 1.